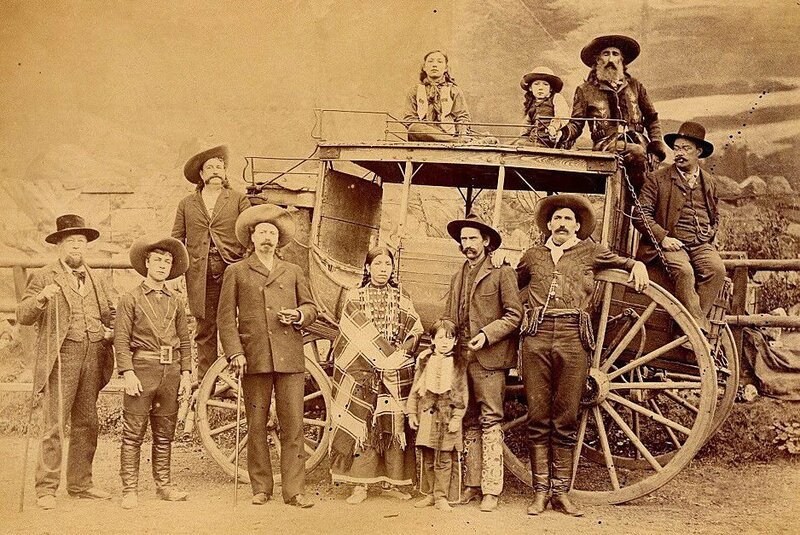 Numerous Wild West personnel with Deadwood stagecoach, ca. 1889. Buffalo Bill stands in front of the smaller wagon wheel with Major Burke behind his right shoulder. Major John Burke, P.R. 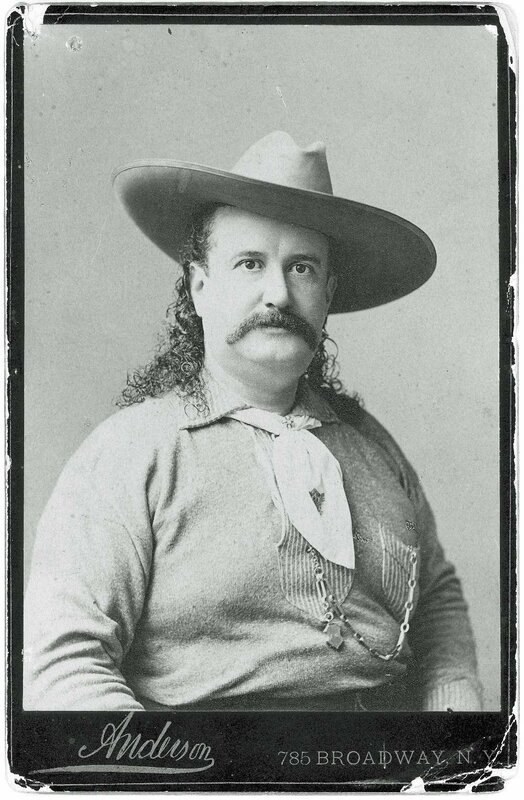 man for Buffalo Bill’s Wild West, ca. 1890, New York. Major John Burke, one of the most clever and colorful publicists in history, is about to pull off his greatest promotion ever: staging a dramatic return to the limelight on Wednesday, April 12, the centennial of his death. Curator Jeremy Johnston will represent the Buffalo Bill Center of the West in memorializing Burke, Buffalo Bill's P.R. agent. In suitably Burke-like promotion, historians and descendants of Buffalo Bill’s Wild West P.R. man, a rotund fellow dubbed “Major,” will gather at 11 a.m. on Wednesday at Mount Olivet Cemetery in Washington, D.C., to “right a historical wrong,” according to event organizers. Exactly 100 years ago, Major John M. “Arizona John” Burke, of Buffalo Bill’s Wild West, died and was buried in an unmarked grave, left to languish in historical obscurity. Now, descendants, western scholars, writers, researchers, publicity executives, and friends will assemble at Mount Olivet to mount a gravestone for Burke and celebrate his amazing life. And it's all happening, in part, because Burke left behind a few clues and a wink-and-a-nod to future historians. Burke — a onetime frontier scout, press agent for William F. “Buffalo Bill” Cody and his Wild West from 1872 to 1917, and an early pioneer of many marketing techniques — was once world-famous. He met every U.S. president from James Buchanan through Theodore Roosevelt and associated with European royalty. Children swarmed around the Wild West camp to see him. His photograph was widely reprinted, and newspapers heralded his arrival in town two weeks ahead of the show with flattering headlines like “Prince of Press Agents Hits Atlanta for a Day” (Atlanta Georgian and News, October 14, 1909), “Picturesque Burke Makes Way for Show” (Baltimore Sun, May 10, 1913), and “Jolly Colonel Advance Agent John M. Burke Springs Yarns and Makes Friends” (Austin Statesman, September 21, 1912). Burke’s remarkable innovations — such as celebrity endorsements, press junkets and press kits, publicity stunts, op-ed pieces, mobile billboards, custom publishing, and product licensing deals, most of which had never been seen before — helped attract 50 million people to the Wild West show, making it the first great entertainment property in the world. In the process, he methodically built up the almost mythic western hero image of Buffalo Bill that survives to this day. In one 1910 promotion, Burke engineered a deal with the American Caramel Company to produce a set of trading cards featuring “legends of the Old West” such as his boss (Buffalo Bill), as well as General Custer, Sitting Bull, Davy Crockett and Daniel Boone. Cleverly, the ingenious Burke also managed to slip himself into the 20-card set, perhaps because the Delaware native liked to exaggerate his frontier credentials. More likely, though, it was simply an ironic wink to future press agents, publicists and historians. When Burke died on April 12, 1917, just 92 days after Cody — of a broken heart as some historians later speculated — he was penniless and had no heirs. No one knew of his desire to be buried at McCullough’s Peak in Wyoming’s Bighorn Mountains, which had been detailed in a 1902 New York Times article titled “Tomb Among the Clouds.” So, the Benevolent and Protective Order of Elks took control of the funeral and arranged for him to be buried in D.C.’s Mount Olivet Cemetery in an unmarked grave. There he’s lain for 100 years. Dobrow found a former federal investigator named Dennis Haynes, who was interested in the story, and Haynes managed to track down descendants of Burke’s brother, Thomas Burke. After trying to persuade several of them of the legitimacy of the tale, Dobrow finally found James Fuqua of Wilmington, Delaware, Burke’s great grand-nephew. He was aware of his family’s connection to Burke and the Wild West, and granted permission to mount the headstone. Dobrow then spent $3,100 to have Mount Olivet create the marker. “That’s probably more money than my book will ever bring in to me, but this has never been about profit. It’s about righting an historical wrong,” Dobrow declared. Haynes, Fuqua and his sister and cousin, along with their families, plan to attend the Wednesday ceremony. Guest speakers will include Johnston; Steve Friesen, director of the Buffalo Bill Museum and Grave in Golden, Colorado; and Michelle Delaney, senior program officer for History and Culture at the Smithsonian Institution, whose forthcoming book, "Art and Advertising in Buffalo Bill’s Wild West," is scheduled for release in 2019. On the guest list are representatives from the U.S. Army Quartermaster Corps, in which Burke served as a civilian during the Civil War, and from the St. Aloysius Church parish in Washington, D.C., to which Burke belonged. Dobrow also traveled to the Bighorn Mountains to retrieve some stones to place at Burke’s grave. Media and the public are invited to the ceremony, although space is limited and advance reservations are requested by calling 301-580-6666. A Plains Indian game workshop will be led by Assiniboine educator Ernest Gendron on June 29 at the Buffalo Bill Center of the West in Cody, Wyoming.